I like Joss Whedon. Firefly, Serenity, The Avengers, even Alien Resurrection. Yet I'm not one of the legions of fans who insists "Joss Is Boss"; just because he's made one or two things I've really liked doesn't mean that I'll blindly follow him into anything with his name on it. Especially when his name is on a cabin in the woods that my friends refuse to tell me anything about, aside from the fact that IT'S JOSS. WHEDON. Sorry--I did just say JOSS. WHEDON, right? I thought for a second I'd heard myself say JAMES. CAMERON. ::ahem:: It's primarily the gore that turns me off from horror movies, though even if I can get past that, it's usually the premise or the locations or the characters that do nothing to pique my interest. That's why the Alien films, especially the first one, are such big exceptions--it's space, it's characters with enough brains and muscle to stay alive by more than sheer luck, and it's more often a psychological horror of what might happen than what actually does happen. That's why I sighed along with the other characters in the booth when "Zombie Redneck Torture Family" (or whatever they were called--I'm quoting Wikipedia here), was selected from the list of monsters that would terrorize the visitors to the cabin in the woods. If there's one monster that has been overdone--and if there's one monster I can barely tolerate in the first place--it is the unsubtle zombie. Perhaps that was the point. Another zombie movie. In my experience, Joss Whedon doesn't do anything entirely straightforward, and creating a parody of the horror genre that was, in itself, still a legitimate horror movie, was quite clever. At least, I'm assuming that's what he did--I had my eyes closed half the time. I cannot handle slashy gore, and that's what you get with zombies. Come back to me when zombies can fire rocket launchers and accidentally shake themselves apart with the concussion. As a side note, my squeamish tendencies have helped me to develop a "something horrible is about to happen" radar, and I've gotten extremely good at anticipating when a big scare is about to occur--and my rate of guessing when it's just going to be a cheap fright is about 50%. With Joss Whedon, however, I have unfortunately developed a more specialized radar: the "Joss Whedon is about to impale someone" radar. It activated itself for the first time after Serenity, started blipping slowly in The Avengers, and went into overdrive in Cabin in the Woods. I'm onto you, Joss. 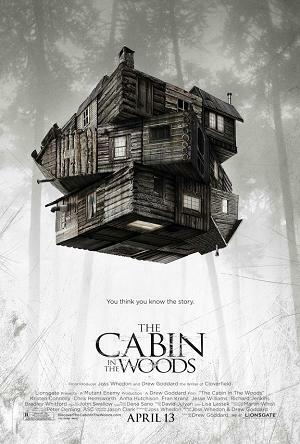 Ultimately, I didn't like The Cabin in the Woods. I recognized Joss's signature humor and the clever twists on the genre, but I couldn't fully appreciate them because of one key component that was a total turnoff: the gore. For an hour and a half, I was like a motion-sick asthmatic trapped in a car with locked windows driven by a tipsy smoker. Doesn't matter how good the scenery or conversation are in that kind of situation. A few weeks later, I saw The Hunger Games. Suddenly, I liked Cabin a whole lot more. Both movies have a similar premise: People live and die on national television for the entertainment of the masses, trapped in an arena controlled by others who have the power to gently or forcibly impact how matters are unfolding. Aside from the obvious differences of style, casting--pretty much everything, really--Hunger Games was considerably more depressing than Cabin in the Woods. When the technicians crank the heat to encourage two characters to throw their clothes off--leaving them unprepared for a zombie attack--it's kinda funny. When the technicians light a forest on fire to push one character unprepared into a fight with some other "Tributes," it's kinda disheartening. Curious how such similar actions can have such a different emotional impact on the viewer, depending on the context. When basically everybody dies in Cabin in the Woods (seriously, this is not a spoiler--it's a horror movie), there may be a pang of regret for any of the characters you kinda liked, but by the very nature of the genre, it's unlikely and/or inadvisable to get very attached to anyone. If anything, you get attached to the concept, or the villain(s), or the overall situations that lead to such creative, horrific deaths. When basically everybody dies in Hunger Games (seriously, this is not a spoiler--it's a movie about people killing each other to death), there's this lingering feeling of emptiness--especially when the survivors turn around at the end of the movie and put a happy face on everything that's happened (OK, that is a spoiler). The characters are at the heart of the movie, and there is no victory in lying to oneself after all that suffering and senseless loss. I know there's a bigger picture with two more books in the series to be turned into movies, but I've looked ahead at the plot synopses of them, and I really don't see anything compelling about sticking around for them. I'm generally more critical of serious and depressing movies than I am of any other kind, because I'm the type of moviegoer who wants to laugh, smile, and generally take a break from anything serious and depressing in real life. However, if I am intellectually or emotionally enriched by the experience, I don't care what kind of movie it is. 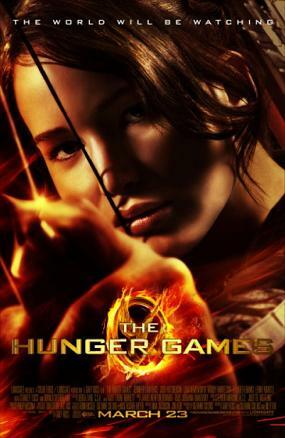 The Hunger Games had all the right ingredients to spark discussions of politics and morality, pique one's curiosity in a richly developed fictional world, even inspire the audience to stand up against dubious authority...but it ended up being an unsatisfying 2-1/2 hours spent in a fictional world centered around the Hunger Games arena (in contrast to having the story be centered around the arena; it's a subtle difference, but a significant one), with characters who have just enough personality for you to feel sorry for them when tragedy strikes, and who constantly submit to power and authority they cannot or will not challenge. No matter how many individual moments or aspects of the film I may have liked, ultimately I felt hollow and thoroughly unenriched. No thought-provoking message; no triumph of good over evil; no success other than, "well, some of you didn't die." If you don't connect with the characters, don't get absorbed in the world, and don't think about the film beyond the walls of the story, it doesn't matter who survives. That being said, The Hunger Games helped me to look beyond the uncomfortable parts of The Cabin in the Woods to more clearly see the film's merits. Sure, it was gory, but it creatively used those same elements that appeared in The Hunger Games to make a truly unique contribution to the horror and parody genres, all the while being a generally fun and entertaining piece of cinema under all that oozy blood. The farther away I got from that nauseating feeling I had while watching the film, and the more I compared it to The Hunger Games, the more I appreciated what Cabin in the Woods achieved. But I still can't say I liked it. So, the next time my wife says I only like sci-fi action movies where stuff blows up, I can now point to one or two more movies and say, "nuh-uh." Oh no. Not just stab--impale. Thing about Hunger Games though- the book is written in first-person present tense, so the book gives SO much more detail, backstory, and even personality to the characters. One of the things that really bugged me about the movie was those....dog things that showed up near the end. I was asking myself, "What the heck? Giant monsters out of nowhere? Why do we suddenly have to have monsters? "; in the book, our narrator explains that they're giant wolves that resemble the dead tributes- basically souls brought back for revenge. I don't go for horror movies either. I can't say I've ever actually WATCHED a horror movie.